The first time you might think about replacing a school flat roof is when it leaks. But the steps you take next might make the difference between a simple low-cost solution or a lot of unnecessary expense. Before you get a flat roof replacement, here are five questions you should ask about it. Is a flat roof replacement really needed? A flat roof replacement is a big job – do you really need one? Is it caused by a failed detail? For example, if your flat roof abuts a brickwork wall. In this situation, driving rain will soak the brick and enter the wall, running down the cavity inside. The water should hit a cavity tray at the bottom and come out of weep holes onto the roof. However, if the cavity tray is missing, then the water will run down the brickwork and cause damp on the wall below, pond on the deck, or run across a concrete slab, displaying as a leak wherever it comes out. You might think your roof is leaking but its actually a missing cavity tray. Is it caused by interstitial condensation? This is where water vapour generated inside the building (think a lot of sweaty students) rising up into the roof structure and condensing into water within the roof – often within or above insulation layers. This water can then leak back into the building, and you think you have a leaking roof but you don’t. A well-designed roof will incorporate a Vapour Control Layer to prevent this happening, and a calculation will have been made to check. It is caused by failed upstands– for example if you have rooflights, the detail around them may have failed rather than the roof membrane itself. This is particularly likely where two materials are used together. For, example if a different material is used to waterproof around the rooflight, it may have a shorter life than the main membrane, which might be fine. In this case the only issue is the detail, and stopping the water coming in won’t require a roof replacement. Of course, you can’t be expected to know what has caused the leak, so the answer is to get a professional in to survey your school roof. The survey will identify the cause of the leak and whether a flat roof replacement is necessary or if other action can be taken. One major cause of not dealing with leaks in school roofs is lack of funds, but there are options to support you in this instance. Firstly, is your flat roof still under guarantee? If so, contact the manufacturer and ask them to sort it out. Make sure you have the warranty documents to hand. Secondly, if your school is an academy or sixth form college, you may be eligible for funding from the Condition Improvement Fund (CIF). The Condition Improvement Fund (CIF) is an annual bidding round for academies and sixth-form colleges to apply for additional capital funding. SIG Design and Technology will help you with a CIF funding bid, which if properly made with expert help, could fund the work required to deal with the leak and a full flat roof replacement if necessary. What are the options for dealing with a flat roof leak? Minor Repairs – just fixing a failed detail or puncture, for example, may cost between a few hundred pounds to a couple of thousand. Large Area Repairs – Where larger areas of roof have failed it may be necessary to make larger repairs and replace sections of the roof. Thermal Upgrade Overlay – this option allows you to improve the insulation value of the roof, increasing what is known as the U-value to current Building Regulations. 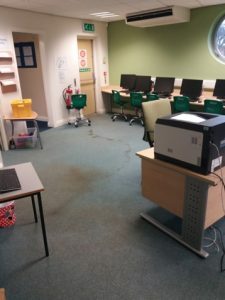 When we apply for CIF Funding we would normally go for a thermal upgrade to reduce energy costs and improve the learning environment further. Strip to Deck and Replace – if the roofing membrane has reached the end of its natural life, if it has been damaged by interstitial condensation or if the insulation is water damaged or saturated with water, a replacement of the insulation and membrane may be required. Complete Flat Roof Replacement – in the more extreme cases, where the deck on which the roof sits has itself failed (by rot or rust usually). Then it may be necessary to strip off the whole roof, including the deck, and do a full flat roof replacement. This is relatively rare, and often roofs are not in such a poor state. Reading the above when you’re in a working school, you may be prompted to ask next, what are the risks associated with flat roof replacement? There are three major areas. The first area is the risk of using an inexperienced team or poor installation. You may be tempted to draw on an existing contractor who doesn’t have roofing experience to carry out the repairs. This can however land you with more costs later on, as described well in this story. The second area are risks during the works. Any work on site by a contractor involves hazards. However, a responsible team will carry out all the necessary health and safety procedures to minimize or eliminate the risks. 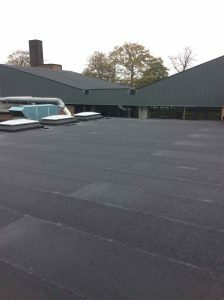 You can read more about the process in this article, and here’s another about carrying out roof works during term time. Finally, worth considering are the risks of not replacing the flat roof or carrying out repairs swiftly. Whilst a flat roof is out of sight and out of mind, the leak isn’t. The longer you leave it the more damage may be caused and you may have to go for option 4 above rather than option 2; a bigger task with larger health and safety risks in the meantime. Here’s a post about the hazards of a leaking roof. Now we’ve filled you with foreboding, how do the answers to our questions resolve into a positive solution which allows you to get on with the job of running the school and put the matter of a leak to one side once and for all? The answer is planning ahead. It is clear that the greatest risk associated with your flat roofs is not planning ahead for their proper upkeep and maintenance. By the time the roof is leaking, it is already well along a path which might have begun with a simple blocked gutter or broken pipe. Conducting planned maintenance of all your roofs is the most essential task to avoid additional loss and expense, and it needn’t cost you a penny. SIG Design and Technology provide their roof surveys for free and we also work with academies, sixth form colleges and Multi Academy Trusts to keep an eye on all their roofs. We can develop a long term planned maintenance scheme for all your roofs to keep the work required to a minimum and keep you in control of the process, so you can get on with the job. If you’d like to know more about our school roof surveys, Condition Improvement Fund applications or have a question about your roof, get in touch.